Note from shop owner Vacation mode is on! I'm getting married this spring and will be closing my shop to prepare for the wedding. Vacation mode is on! I'm getting married this spring and will be closing my shop to prepare for the wedding. Love the hair comb!! At first I didn’t get it so I talked to her and she sent another one a few days later. Her response time is great. I can’t wait to wear this on my wedding day! It’s perfect! Beautiful product and excellent service/communication! 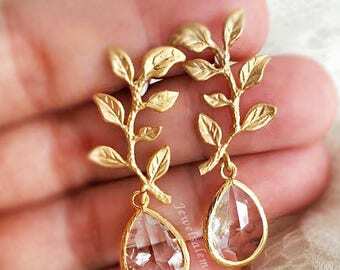 Honey yellow leaf earrings for Autumn. Beloved, unique floral bridal designs which we have been creating since 2011! Our studio is always filled with fresh blooms. We are craftswoman and gardeners who adore flowers. "Avant tout, je dois avoir des fleurs. Toujours, toujours"; Claude Monet: I must have flowers, always and always. Handmade accessories like hair combs will bring something unique and alluring to the ensemble, especially for a bride. My name is Sereine and my journey of love began with the love for flowers. Growing up in Singapore, in a culture where east meets west, and it was there, a creative seed was sown in my heart. My mother told me that since I was a child, I had gravitated towards floral designs and anything that was vintage and quaint. Whenever Mommy would sew dresses for my sister and I, I would always choose floral prints, then picked out her vintage jewelry to wear with my frocks. It was during this period when I began a life-long love affair with dresses and jewelry. I would like to attribute that to the fact that my maternal grandmother's name in Chinese, is "Bloom", and coincidentally (or not), she had loved wearing floral prints. Afternoons were spent in her garden, roaming around the plants she and my grandfather had planted, creating bouquets. Those carefree, happy days are memories that remained with me, perhaps cultivating my love for flowers from a tender age. Being able to work with floral designs is truly a very satisfying process for my old soul. I especially enjoy customisation process for each client. Be it for a wedding, an event, or just for yourself to wear daily, we welcome conversations to discuss each client's needs. And this is the best thing about Etsy - we can build relationships with our customers. Being able to communicate directly helps us bring better services to you, making sure we can take care of each client and address their individual needs. Here at Shop Delovely, we strive to constantly improve, and by listening to feedback and comments, that is how we can bring better service to all customers. We hope you can find something you love here. Something that takes your breath away. Here is a big thank you to all customers, for trusting in Shop Delovely. Without you, there will not be us. God bless! I grow up reading Dickens, admiring Jo March, listening to Coltrane and dreaming of living in Hemingway's Paris. I feel as though I am constantly seeking the world forgotten by time yet missed by many. Lily is my mother. She joins our team, assisting in the making process. Being a fan of British floral prints, Lily brings with her an eye for design and color. She is also my trusted confidante and advisor. Aedan works full time as a legal consultant and part time as our assistant. He sometimes helps us with shipping out part of our orders to facilitate a more efficient and faster delivery experience. He also handles complaints and feedback. Madam Wong is our part time seamstress and shipper. She has 30 years of dress-making experience. As we try out dress making in Jewelsalem, Madam Wong gives advice on how to cut the fabrics, and helps put our concept into real creations. Adding into our contact list to send you information about our products listed on Etsy. You can opt out of this if you like. We accept custom orders and welcome you to contact us regarding what you need! Do note that customised / personalised orders are not refundable. If you wish to cancel a custom order, you can do so before the final design is shown. After you have approved the design but still wish to cancel the order, a 50% refund will be given with the cancellation. The customised item(s) will take longer to create than existing items that are for sale in the shop. Please take the time needed into consideration when you purchase a customised item. You are welcome to check the timeline with us. For hair accessories, we reserve the right to substitute some components if they are out of stock, but we always make sure the change is not noticeable. All items are gift wrapped. If you need to customise the packaging or wrapping, do contact us! For certain jewelry, we discourage the use of detergent and chemical when wearing the items. If you need more information, feel free to contact us. Custom orders are NOT refundable. To cancel, please read above point - "Custom and personalized orders"
Orders that arrive "late" are NOT refundable. We cannot guarantee exact delivery date. Please take into consideration postal delays and custom inspection, missed mail delivery etc, and order ahead of time. We are not responsible for external circumstance that affect delivery. Do contact us if there is any problem with your order. If we agree on returning the item, please return the products securely wrapped and provide tracking. If item is returned damaged, it will affect the refund. Free gifts, promotional items are not refundable or returnable. We are not liable for free gifts as they are gifts, given free, as a form of goodwill. If your package has not been marked yet, then that is because item(s) are still being made. We usually mark "shipped" after 1-2 days. You should receive your order in 10 - 18 business days generally. But if it has passed this time frame, do convo us to check on the status. If there is tracking for your order, I will be able to advise on the status of the order. We try to use the most efficient and quickest method to ship to you. Items are not considered lost if it has not passed 30 business days. There are a few reasons why you have not received the order. Custom delays, weather, missed delivery, holiday seasons are possible reasons. I have an issue with you, I will write a negative feedback! We appreciate all constructive feedback. We take pride in our work and our goal is never to cheat or deceive our clients nor are we frauds. We are serious about our craft and we care about our work. If you have an issue with the item you received or with "lost" packages (which most of the time are just delayed), please contact us first instead of jumping immediately to a negative feedback. Give us a chance to make it right and we promise we will find other ways to make this a happy and satisfactory purchase experience for you. If your order has tracking, please track your package with singpost.com or contact us and we can check for you. If you are given a tracking number, it will definitely work. So please do not worry about this. Tracked packages have to be SIGNED FOR. If tracking is provided, you are responsible for ensuring the item is delivered to you. Make sure there is someone to sign for the package. If you miss the delivery, it is your responsibility to ask your local post office for the whereabout of your item and follow up with them. You refuse to answer my mail! We do not work on weekends, like many of you, so usually we do not reply convos on weekends. If you send us a message, we will write back when the work week begins. For US, UK and EUROPE - Regular shipping generally takes 7 - 20 BUSINESS DAYS (meaning: not including weekends). Please note we do not work at the post office and have no means of guaranteeing delivery on certain days. There have been feedback that some packages going to CANADA recently take around 2 months to arrive. This is out of our control. We advise you to read our policies and take the delivery time into consideration. We strongly encourage Canadian clients to opt for Fedex or DHL delivery services. We also reserve the right to cancel orders to CANADA due to the long shipping time. If you need more secure and detailed tracking, or for express shipping (delivery within 1 - 4 days), please convo us for rate. We are also found under Jewelsalembridal on Etsy. We reserve the right not to ship our products to certain countries. For instance, we do not ship to China, South America, Middle East. Thank you for your understanding.